The metric system is a decimal measuring system based upon the meter. The metric time base unit is the second. Metric submultiples include the millisecond, microsecond, and nanosecond. Metric multiples include the kilosecond and megasecond, but for everyday use, non-metric minutes, hours, and days are used, instead, and larger units such as weeks, months, and years. This has apparently led some to conclude that time has been completely left out of the metric system, or at least needs to be reformed. The original decimal metric system was introduced by the French in the 1790's, and takes its name from the base unit of length, the mètre (spelled "meter" in the US), which was originally defined as 1/10,000,000 the distance from the North Pole to the Equator (going through Paris), and from which the other original base units were based. Intended to replace the hodge-podge of many different measures in use at the time, the metric system was designed so that all units which measured the same quantity were related to the base unit decimally, and created by adding metric prefixes (such as déca for 10, déci for 1/10, etc.) to the base unit name. Slightly different versions of the metric system were developed by different specialists in different countries, which were all replaced in 1960 by the modernized metric system, the International System of Units (SI). There is some confusion about what is "metric time." Various people have proposed systems called "metric time," but often these proposals are for decimal time of day formats which have little, if anything, to do with the metric system. The metric system is decimal, but not all decimal systems are metric. To be metric, multiple and submultiple units must not only be related decimally, but also must be formed by adding metric prefixes to a base unit name. Also, the metric system, itself, defines units of time interval, not time of day (clock time) although other standards use the SI unit of time interval to determine the time of day. The provision of the law of 4 Frimaire year 2 (November 24, 1793), which makes obligatory the usage of the decimal division of day and of its parts, is suspended indefinitely. In addition, the decrees introducing decimal time defined five seperate decimal time units, mostly with the same names as standard time units (décade, jour, heure, minute décimale and seconde décimale) instead of a single base unit combined with metric prefixes, such as déca, déci, centi, milli, etc. None of the other decrees relating to the metric system provided for units of time, either. Therefore, decimal time was not a part of the original French metric system. So the original metric system did not include a unit of time interval. In 1832, the German mathematician, Karl Friedrich Gauss, combined the second (originally defined as 1/86,400 mean solar day) with metric units to form what was to become the basis of the Gaussian System of Units, or cgs. Other versions of the metric system also used the second as the base unit of time interval. In 1960 the ephemeris second, defined as a fraction of the tropical year, officially became part of the new SI system. Since the mean solar day and tropical year both vary slightly, the SI second was defined more precisely in 1967 as 9,192,631,770 cycles of the vibration of the cesium 133 atom. Metric prefixes are often used for decimal submultiple units of time interval, such as milliseconds, microseconds and nanoseconds, but larger quantities are usually measured in non-decimal units such as minutes, hours, days, etc., instead of kiloseconds and megaseconds. For this reason, critics claim that truly metric time does not exist, and since the second is not a decimal fraction of the day, it also cannot be used as the basis of a decimal time of day. Uniform time scales used for determining the time of day, including International Atomic Time (TAI) and Terrestrial Time (TT), essentially count SI seconds from a fixed epoch, and divide this count by 86400 to determine the date, using the remainder of seconds to determine the exact time of day. Civil time is determined by Coordinated Universal Time (UTC) which differs from TAI by an exact number of SI seconds inserted in order to keep civil time to within one second of the earth's actual rotation, because the SI second is about 60 cycles shorter than the mean solar second. Thus, the difference between UTC and uniform time scales such as TAI has been increasing on average about one second every couple of years. Unix time is an application of the SI second used in the Unix operating system, and some other operating systems and programming languages, and is determined by a count of (non-leap) SI seconds since January 1, 1970, 00:00:00 UTC. Time before this is represented as a negative number. It is often divided into milliseconds and even microseconds. Originally the data space only allowed Unix times up to the year 2037, but newer implementations do not have this limitation. Unix times have been greater than 1,000,000,000 seconds since 2001. Unix time, by itself, does not qualify as either a date or time of day, because it neither counts days, nor divides them, but rather is intended to be used to convert back and forth between different date/time formats. In 1897 the Commission de décimalisation du temps was created by the French Bureau of Longitude, with the mathematician Henri Poincaré as secretary. The base unit of metric time proposed was the standard hour, divided decimally. However, scientists and engineers had already settled on the centimetre-gramme-second system, in which electrical units were defined in terms of the standard second. [T]o avoid confusion, prefix symbols (and prefixes) are not used with the time-related unit symbols (names) min (minute), h (hour), d (day)...(see Table 6). There have been many proposals to reform metric time based upon decimal fractions of the day. There are several factors which would have to be taken into account. The metric system defines a single base unit for each quantity that can be measured. The metric base unit of time interval has for a long time been the second, originally defined as 1/86400 mean solar day. The day, itself, is the most important natural time period, so most proposed metric time reforms choose a base unit that is a decimal subdivision of the day. Lagrange proposed using the day, itself, as the base unit, divided into decidays and centidays, shortly after the provisional metre, decimetre and centimetre had been introduced. However, decimal time reform had previously been introduced with different units, and proven unpopular, so metric time was not included with the new metric system. In the 1890s, M. Joseph Charles Francois de Rey-Pailhade, President of the Toulouse Geographical Society, proposed 1/100 day, which he named cé, an abbreviation of centiday, with submultiples décicé, centicé and millicé. The cé is close in value to a quarter-hour, and thus he reasoned that it would be a useful unit. However, the Commission de décimalisation du temps rejected this base in favor of the standard hour equal to 1/24 day, and neither proposal gained much acceptance. 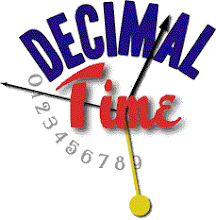 The "decimal minute" (1/1000 day) has been suggested, which would allow the day to be expressed as a decimal multiple with the prefix kilo-, and metric prefixes would exist for every decimal submultiple of the day down to one-millionth of a day. The "decimal second" (1/100,000 day) has been proposed as the new base unit, because it is close to the SI second, and would be more convenient for deriving secondary units, although there would inconveniently be no metric multiple equal to a whole day. 1/1,000,000 day would make the day one mega-unit, although the base unit would be significantly smaller than the SI second. A new name would have to be chosen for the new metric base unit of time interval. If the day (symbol "d") were selected, then this would not be necessary. 0.1 (1/10) d, 0.001 (1/1000) d and 0.00001 (1/100,000) d have been called decimal hour, minute and second, respectively, but these would not be acceptable because they would create confusion with the old units, as would some similar-sounding names that have been proposed. Names based upon the Greek word for time, chronos (χρονος), have been proposed, possibly with the Greek letter "chi" (χ) as the symbol, but the current policy is to name new metric units after scientists. The name of Canadian Sanford Fleming, often called "the father of standard time", has been proposed, although someone who actually advocated the decimalization of time, such as Borda, Lagrange or Poincaré, may be more appropriate. Other names based upon colloquial English terms, such as "beat" or "tick", have been suggested, but are not likely to be made official. Another alternative would be to use the day as the base unit for prefixes, but to use a submultiple, such as a milliday or microday, for derived units, as is currently done with the kilogramme, and as was previously done with the centimetre in the cgs system. In addition to the base units for independent quantities, such as time interval, derived quantities and units are obtained from equations derived from the base units; for instance, a coulomb of electric charge is defined as one second times one ampere. Since many derived metric units currently are based upon the current base unit, the SI second, new derived units would need to be defined for all these quantities, which includes most of them. This would make obsolete many SI units, including hertz, newton, joule, watt, volt, ohm, etc. Due to the amount of material which has been published using the SI second and derived units, not to mention all the equipment and education involved, it would be very difficult and expensive to change the base unit of time interval, especially considering that many countries have only recently converted, or are still in the process of converting, to the SI metric system, at considerable expense and controversy. A similar event happened once before in 1954, when the cgs system was replaced by the MKS system (now SI), although they had been co-existing for a long time before that so there was some advantage to settling on one system, and the metric system was not as widely used as it is now. It seems unlikely that a reform of metric time will take place in the near future, at least unless and until decimal time of day catches on more widely, making the old units, including the second, obsolete. How this would happen would likely determine what the base unit and name would be, which cannot now be predicted.